The Association of Malayalam Movie Artists (AMMA) on Thursday expressed their ire at the media over the actress kidnap case and said that the artists are united on the issue. Dileep told a local TV channel that the actress was friends with the driver who she says molested her. Kochi: The Association of Malayalam Movie Artists (AMMA) on Thursday expressed their ire at the media over the actress kidnap case and said that the artists are united on the issue. The anger at the media came when probing questions were put to the AMMA executive committee members, who included association President and Lok Sabha member Innocent and superstars Mammootty, Mohanlal, Dileep and Kerala assembly members Mukesh and KB Ganesh Kumar. 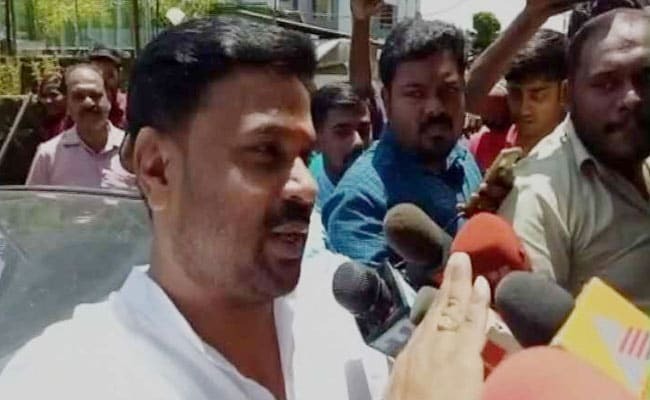 Mr Kumar lost his cool when questions came thick and fast over why the AMMA annual general body meeting did not take up the actress's kidnap case, when she is a member as is Dileep, who was questioned by the police for over 13 hours till 1 a.m. on Thursday. "It was me who had told the meeting that if anyone wishes to raise this issue, it can be raised and discussed. But none had any doubts as they know that AMMA is fair. Both of 'them' (the victim and Dileep) are our own children. We are united and none can break our unity and our organisation," said Mr Kumar. Another member who lost his cool was Mukesh who was asked if the women artists' new organisation, which too like AMMA was silent on the case, did not have any doubts. "The women collective is fully supporting us and they are with us. Why are you asking like this and what is your problem? We have already said that none had any doubts," said Mukesh. Throughout the media interaction, both Mammootty and Mohanlal maintained silence. Dileep said he has already expressed his apologies for his statement against the victim and did it again at the meeting. Innocent said that AMMA has effectively intervened and as soon as the incident occurred, he called up Chief Minister Pinarayi Vijayan and the then state police chief Loknath Behra. "It's true that we did not take out any march of protest. We were asked to remain silent by the police as any response from our side would affect the probe in the case. All the accused in the kidnap case are now behind bars," said Innocent. This was the first meeting of the AMMA since the hugely popular young actress was kidnapped on February 17 while travelling from Thrissur to Kochi by road and was later dumped near the house of director-turned-actor Lal, who informed police. She is alleged to have been molested en route. The notable absentees from the Thursday meeting were Dileep's former wife Manju Warrier, who is the live wire behind the women's new organisation, and the victim. However, an actor who did not wish to be identified, told IANS that the members would not speak against AMMA. "Of the members, it's just around 25 who are getting regular work in cinema and the rest get work on and off, and if anyone dares to speak against AMMA, then their survival in the industry would be in jeopardy, hence none will speak," said the actor.